Click HERE to view the site's NEW Advanced Model Page, available to all through November 30, and to subscribers beginning December 1. The biggest single determinant of natural gas demand is temperature. Cold temperatures during the winter drive heating demand while hot weather during the summer stimulates cooling demand and powerburn. 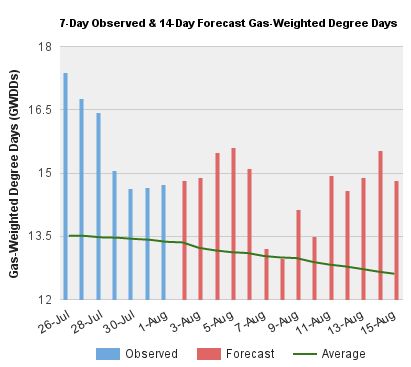 Analysis of near- and long-tern weather patterns allows the talented trader to anticipate changes in natural gas supply/demand balance and their impact on natural gas price. Data and maps for current day, near term (2-14 day), extended term (2-week to 6 month), and historical weather data are presented on this page. Click any of the four quadrants in the table below for further information. 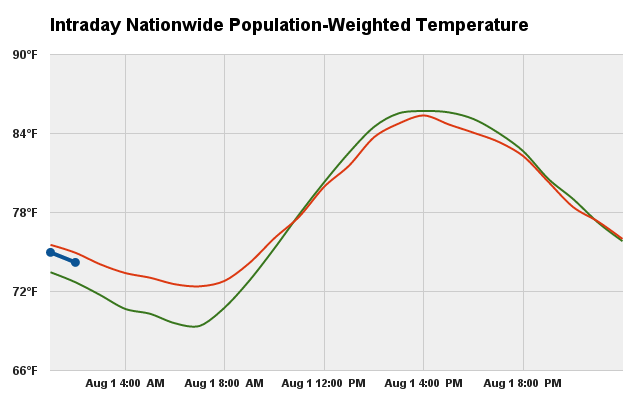 Live nationwide temperature and natural gas-weighted degree day data and maps based on reports from 210 recording stations, updated hourly throughout the day. Computer model data and maps for the 2-14 day range updated four times per day. Long term temperature outlook and trends for the 2-week to 6-month timeframe. Maps and data updated daily. Temperature and degree day data for the past year on a weekly and monthly scale. Data updated weekly.